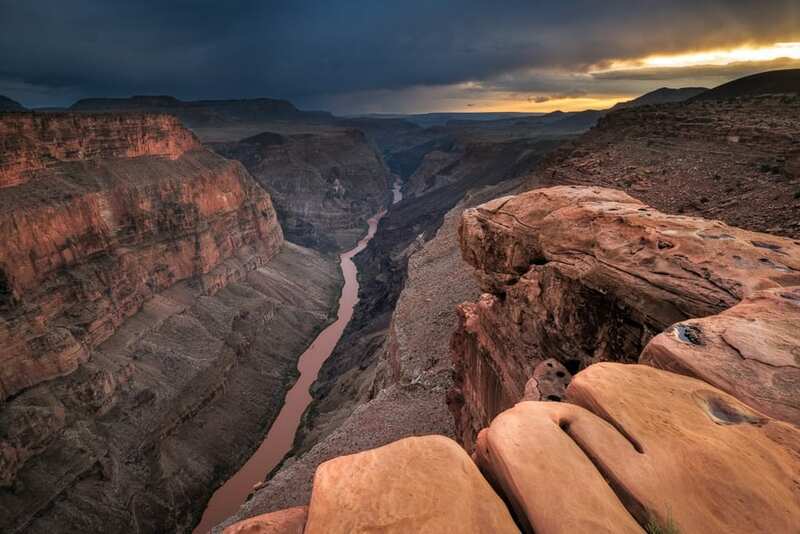 Toroweap is a secluded section of the North Rim of the Grand Canyon that you can visit using a high clearance vehicle. 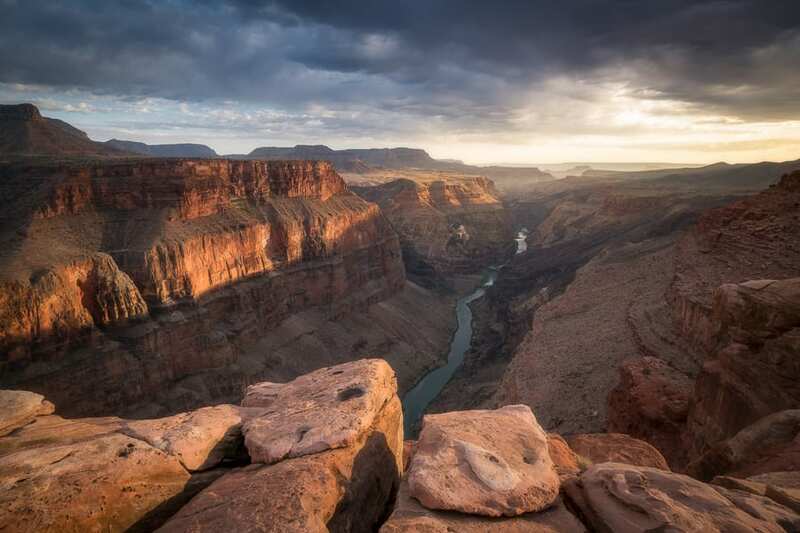 It offers a more dramatic view of the Colorado River than the more popular and accessible sections of the park. 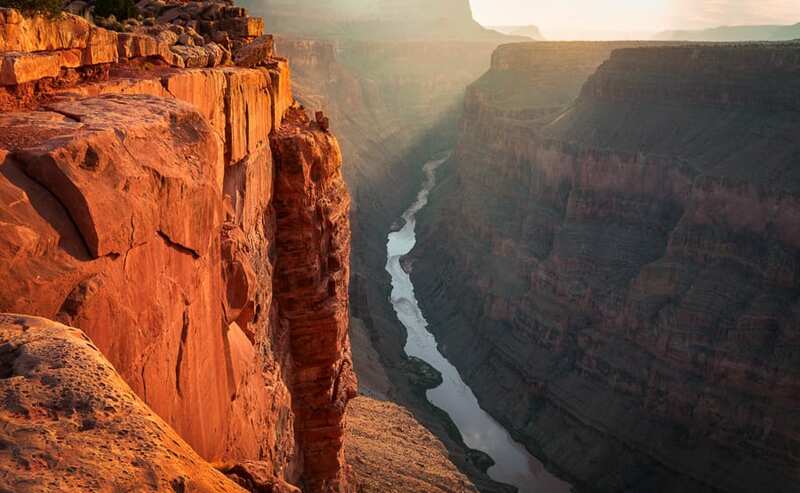 Upon reaching the edge of the canyon, you can look straight down and see the river flowing 3,000 feet below you. There are no services out here and no protection from tumbling over the edge. Aside from a bathroom and a few marked campsites, there is nothing to distract you from the immersive beauty of this remote landscape. In this article, we’ll first discuss some of the history behind Toroweap and then finish with advice on how to photograph it. Dramatic light is what we always hope for at Toroweap! The name “Toroweap” is a Paiute word meaning “the earth.” Toroweap has had many different people use its valley throughout history. Early hunter-gatherers used the valley to collect food and hunt animals as far back as the latest ice age, about 10-12,000 years ago. These people used the valley in spring and summer to collect wild seeds, berries, and nuts. They would hunt mule deer in the fall and return to more temperate climates during winter. Ancestral Puebloans may have been the first people to establish permanent residence in the valley around 1050 AD, lasting until around 1250 AD. Their permanence in this area is generally attributed to conditions that allowed for dry farming along with the ability to efficiently collect rainfall during monsoon season in the summer. Widespread droughts are thought to have contributed to the abandonment of these permanent settlements. After 1250 AD there was a return to the earlier hunting and gathering activity. Ancestral Puebloan and Southern Paiute artifacts suggest that these people still used the area after 1300 AD, just without permanent settlements. 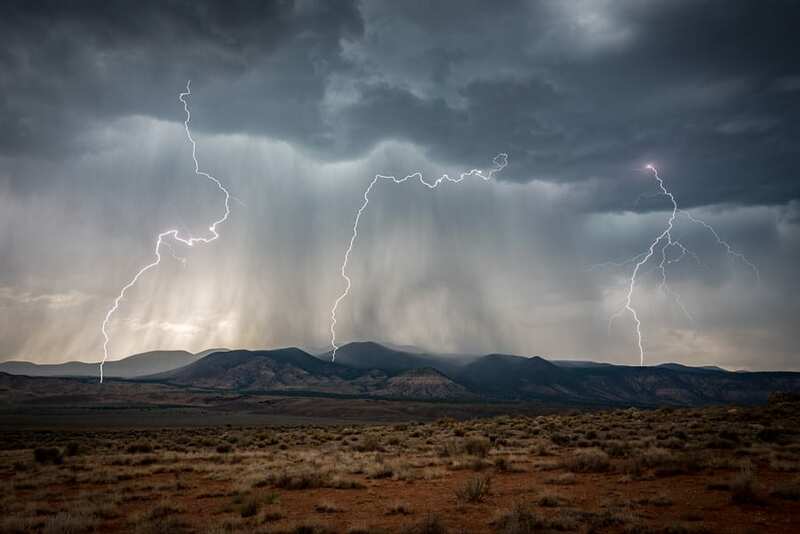 Lightning Storm in the Toroweap Valley. The bolt on the left started a fire but it was quickly doused by the rain. In 1872, John Wesley Powell, on his Second Expedition, visited Toroweap along with other parts of the North Rim. He helped to map and name the local features. Jacob Hamblin, however, is credited with blazing many of the trails in the area. By the early 1900’s, ranchers were using the valley seasonally. Lower Kent Ranch, the first year-round ranch in the area, was constructed in 1927. 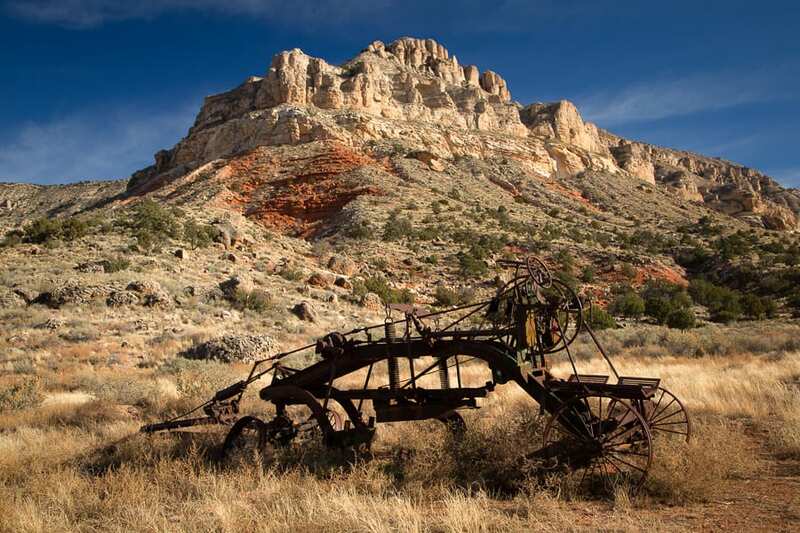 An old road grader in the Toroweap Valley from the 1920’s. Today we know Toroweap as a part of the Grand Canyon National Park, but it wasn’t originally part of the park. 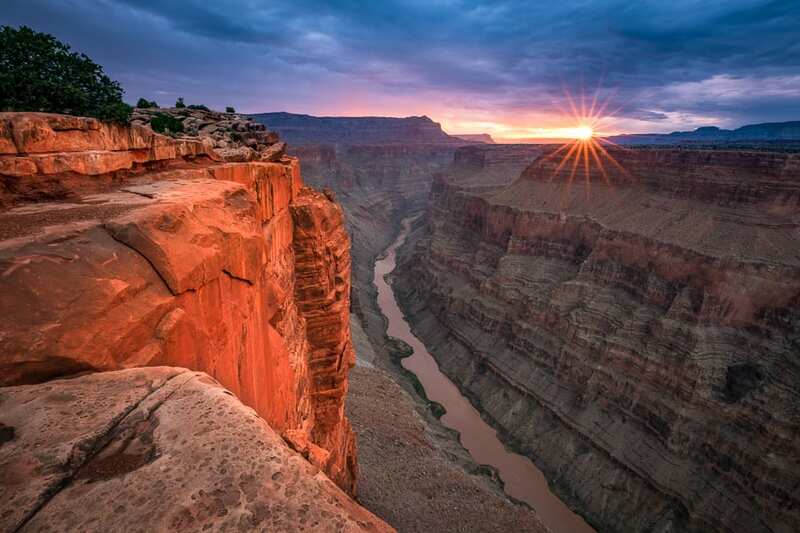 In fact, the Grand Canyon was designated as a National Park on February 26, 1919, about 14 years before Toroweap became a National Monument (December 22, 1932) and another 42 years before it would become part of the National Park (1975). A lucky sunrise looking up-canyon. The entire sky was filled with clouds except this one small band where the sun came up. Even though it has been part of the National Park for the past 43 years, visitation levels remain low. Statistics from 1991-present showed the number of visitors remained stagnant until about 2013 when it started increasing in popularity. From 1991-2012 an average of 19 vehicles per day visited Toroweap, while from 2012-2017, an average of 39 vehicles visited per day. 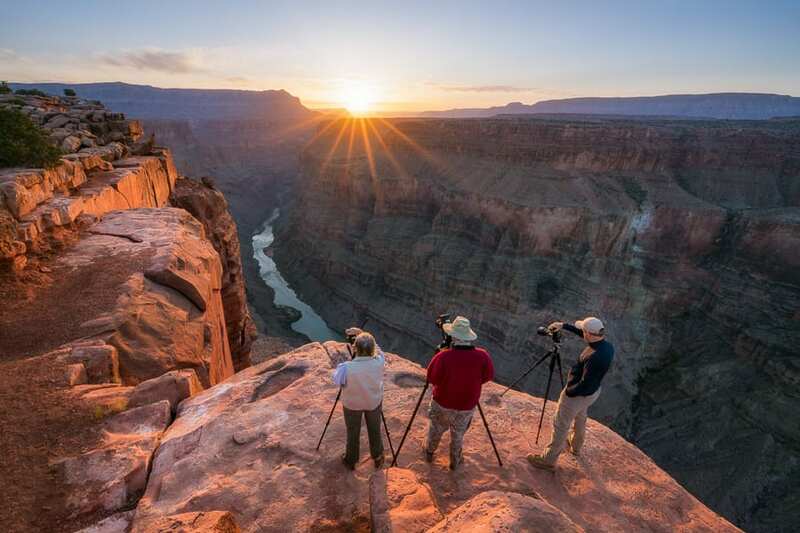 This may seem like a lot of visitors, but pales in comparison to the 316 per day that visit the North Rim and the 3,679 per day that visit the South Rim. Torweap is still a very secluded experience where the chances of seeing more than a handful of other people is extremely rare. This is what makes it such a wonderful place to visit. 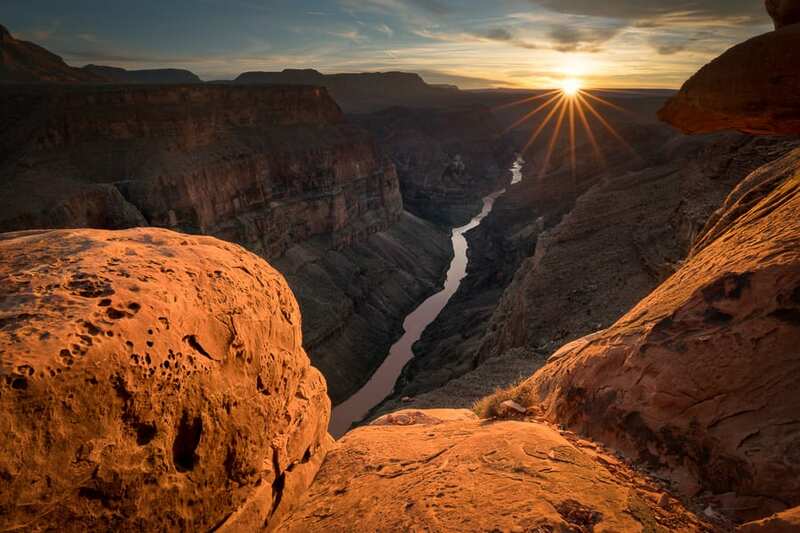 You can see one of the most impressive views of the Grand Canyon and enjoy the silence and solitude. A stormy day on the rim. With light rain falling, a long shutter speed was used to enhance the clarity of the exposure. The most direct route to Toroweap is via Antelope Valley Road, which heads Southwest from Highway 389 about 7 miles from Fredonia, AZ. The turn-off is well marked and it’s a 60-miles on dirt roads to reach the overlook. The road is wide and fairly fast going for the first 40 miles but gets progressively rougher the further you go. There are signs at all major junctions, so you won’t have to worry about getting lost. You’ll pass the ranger station when you’re a few miles from the rim. The last 2.7 miles are very rough and rocky and require a high-clearance vehicle. Those without high clearance can park and walk the last 2.7 miles. 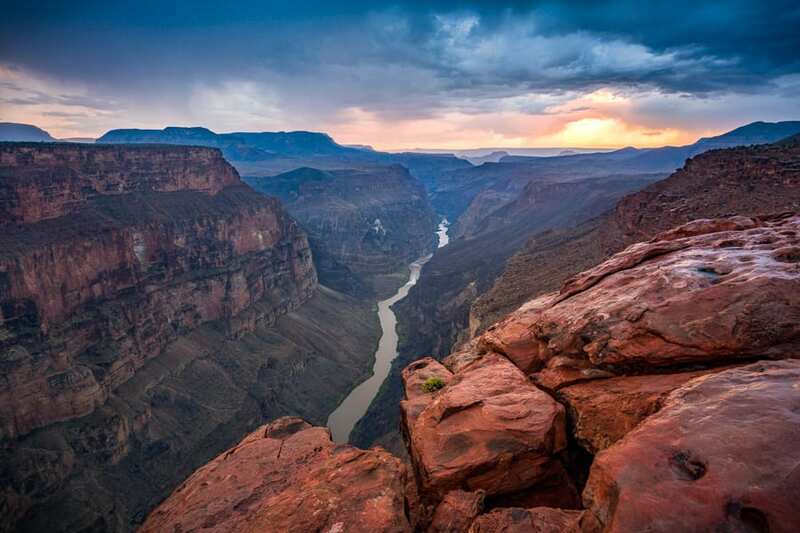 The campground is around 1 mile from the rim and will require rough driving to reach. This area is very remote and there is no cell service (a satellite beacon is recommended for emergencies). Due to sharp rocks, flat tires are common, so make sure your vehicle is well equipped with off-road tires and a full-size spare. If it has been raining or snowing recently, then 4WD is required and expect to find lots of mud. Toroweap is perhaps the most photogenic spot in the Grand Canyon. The light can be sublime and the huge views can overwhelm the senses. When should you visit? During the spring months, the skies are often clear and the road is the easiest to drive. When the monsoon rains come in late July through early Sept, the clouds and storms can make for dramatic photos. But you must be prepared for difficult driving conditions! During the winter months, the setting sun aligns with the river and can produce stunning photos. However, the road is not always passable in the winter. The summer months have the best sun angles for sunrise. The only way you can shoot sunrise here is to camp overnight since they lock the gate after sunset. A backcountry camping permit is needed for overnight stays. The setting sun aligns nicely with the river during the winter months. 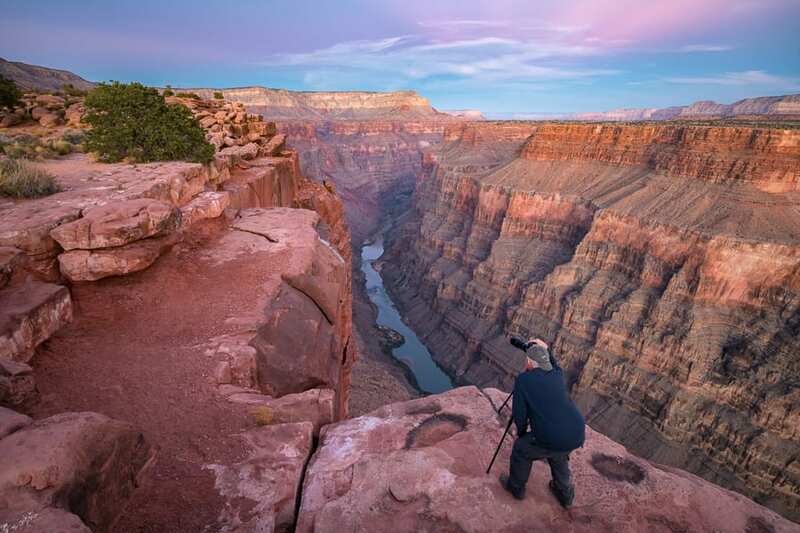 A wide angle lens in the range of 16-35mm is ideal for capturing the entire expanse of the canyon along with some foreground elements. Finding good foreground is very important when photographing Toroweap. Look for nice rocks, cutouts in the rocks, trees, bushes, and cliffs to add depth and interest to the scene. A mid-range zoom lens is great for abstract compositions of the river and surrounding cliffs. If visiting during the summer months, a lightning trigger can come in handy if storms are rolling through the area. Morning Glow on the cliffs high above the river. As far as filters go, bring a polarizer. Instead of polarizing to remove glare from the river, turn it to enhance the river glare. That will help it pop out more in your photos. A polarizer will also help reduce sky contrast, but be careful on blue sky days and watch for unsightly gradients in the sky when using a wide angle lens. Also, don’t use a polarizer if shooting directly into the sun. For you are having issues with high contrast, you can either bracket your exposures or use a Grad ND filter (the horizon line is pretty flat at Toroweap). We recommend that our clients use bracketed exposures instead of Grad ND’s since you have more control over how the exposures are blended in post-processing. Sunset Shot Looking Down-Canyon. Look for interesting foregrounds like this to enhance your compositions. On moonless nights, the sky is extremely dark at Toroweap since it is so far from any light pollution sources. 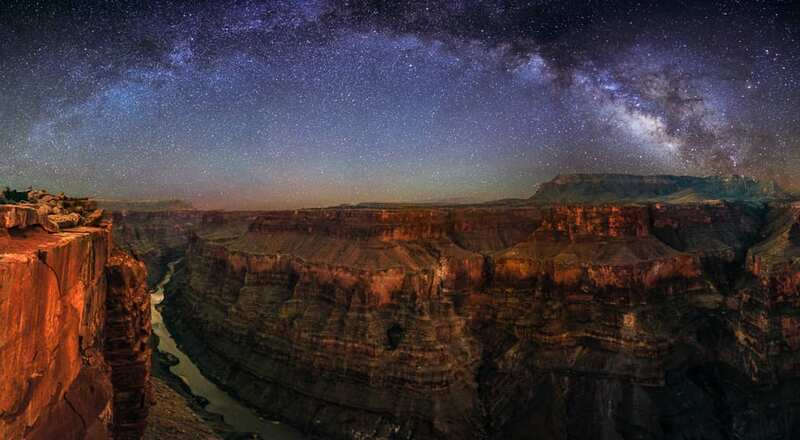 Capturing a Milky Way panoramic over the canyon is one of my favorite ways to photograph Toroweap. The best months to do that are March through May and you will need to camp out overnight. Panoramic stitch of several vertical shots to capture the Milky Way over Toroweap. Finally, don’t forget to take a few shots of yourself or the other people you are with when you’re out there. Including a small person out on the edge can really add a lot of scale. With this view being so huge, it’s hard to translate it into a 2D photo. The wide angle lens tends to flatten things out and it’s impossible to see just how deep it really is. This is one big reason why you need to visit Toroweap in person. Nothing can beat the first-hand view!! Toroweap is best photographed with low contrast light that you get either early or late in the day.